Danat Hawar Resort is being constructed and will be an international tourist destination in Bahrain. Work has recommenced on the resort which is located just off the Hawar islands. 88 artificial islands would be built for sale to private investors. Each island will have its own jetty and villa. 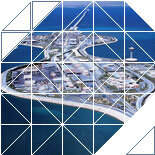 In addition, a larger island will feature a resort hotel, restaurants, a marina and sports facilities.